Some of the IDPs who fled their village due to fighting between the Burma Army and Arakan Army. Chin State in western Burma borders India and Bangladesh and, though receiving little attention from international media or rights groups, continues, like much of the rest of Burma, to suffer the effects of poor governance and on-going conflict. Chin Free Burma Ranger teams have reported incidents of civilian landmine victims and displacement from fighting in just the last two months. 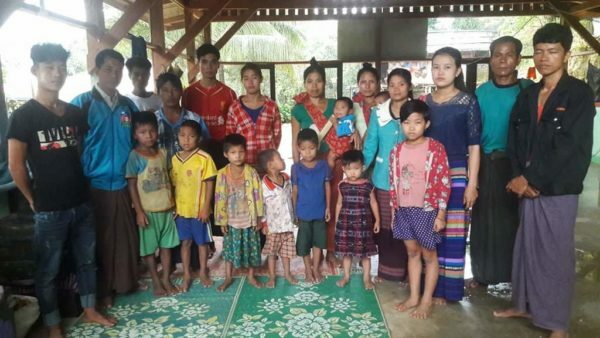 On 20 September Mrs. Daw Phit Leik (28) of Nga Tein Village, Paletwah Township, and five friends went into the jungle to pick vegetables. Whilst doing so, she stepped on a mine and was killed. An 18-year old woman, Miss Tein Tin, was also injured by the blast, according to Chin Rangers. On 29 Oct, at 11:00 a.m., Mr. U Hwe Htan, aged 35 and the father of six from Rat Chaung Village, Paletwah Township, stepped on a mine and was severely hurt. 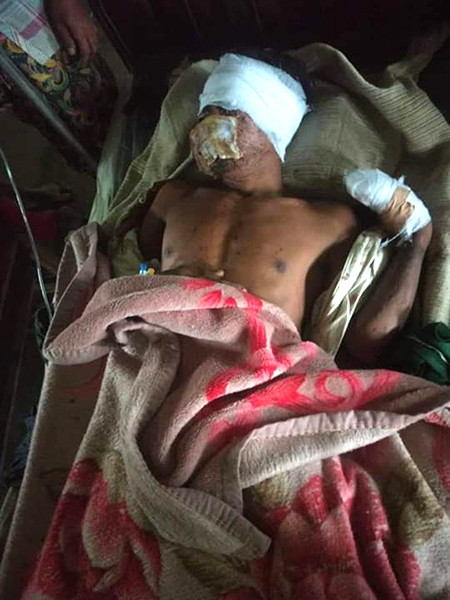 He was taken to Paletwah Hospital, but the extent of his injuries means that he will need to transfer to the main hospital in Sittwe. The situation in Chin State is made more problematic by fighting between the Burma Army and Arakan Army, which has caused many villagers to flee. In other areas, Chin villagers report that the Arakan Army has driven them from their land to have unimpeded access between their bases in Rakhine State and Bangladesh, and the front lines. The FBR Chin team interviewed one man who had fled fighting in his village in September. 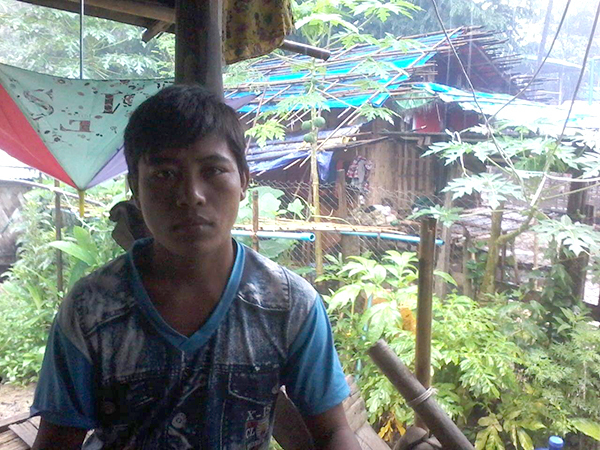 Mr. U Hweh Pin, witness to fighting between the Burma Army and Arakan Army in Tohbwe Village. On Oct. 13 a relief mission led by the Rev. Kan Lwat visited the displaced villagers and reported that they still face great hardship in obtaining foodstuffs and assistance. The fighting between the Arakan Army and Burma Army continues and prevents them from returning to their homes. Additionally, Chin Christians have long faced discrimination and persecution at the hands of the Burma Army and local authorities and inter-religious tensions continue in the area. 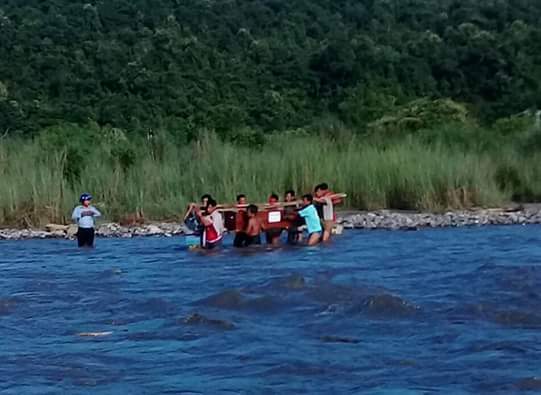 On 29 August a Christian funeral party for Mr. Khwe Mana, who was 37 and left a 7-year old daughter as an orphan, was forbidden from crossing a bridge by local authorities and local Buddhists, forcing the burial party to wade the coffin across the river. This occurred in the town of Saw, Magwe Division. The burial party had sought permission to cross the bridge for the funeral but had been forbidden on the grounds of their religion. The burial party is forced to ford the river with Mr. Khwe Mana’s coffin.